Apple Stock Surges Past $100, But Is It Still A Buy? As Apple stock continues to rise ahead of the iPhone 6 unveil, here’s why Apple shares are still attractive today. After cratering in late 2012 and languishing for much of 2013, shares of technology powerhouse Apple (Nasdaq: AAPL) have rallied to fresh all-time highs above $101, when adjusting for Apple's recent 7-for-1 stock split. There's certainly plenty of reason for investors to be optimistic about Apple stock. In the months ahead, Apple will introduce its highly anticipated iPhone 6, unveil the latest upgrade to its iPad line of tablets, and launch some kind of long-awaited new product as well (perhaps an iWatch). However, amid all this commotion, the most pertinent question for investors today should be whether Apple stock remains a buy at or above its new $100 levels. I certainly believe so. Here's why. 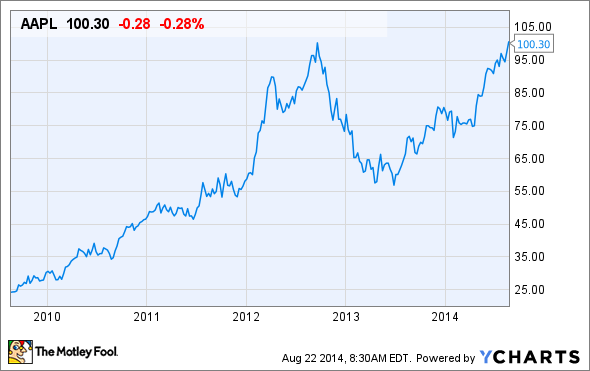 Apple stock: Is the juice worth the squeeze? The prospect of returned revenue and profit growth from a number of drivers has been the primary engine fueling Apple stock's recent rally. As the result of a number of upcoming product moves, investors are widely expecting Apple to enter a new phase of growth and innovation, and I tend to agree. By far the single most powerful contributor to this new growth period will be the iPhone 6. Although it seems few discuss it, Apple's iPhone installed base is due for an upgrade. In the United States, a whopping 49% of iPhone owners currently use either the iPhone 4 or 4s according to data from researcher Kantar. Similarly, the iPhone 4 and 4s represent an astounding 69% of iPhone users in China. Although probably not perfectly representative of the Apple's global iPhone installed base, the overarching point remains--a significant portion of iPhone owners will be ready for an upgrade when the iPhone 6 rolls out globally later this year. The upcoming iPhone 6 launch is by far the most powerful near-term catalyst for Apple, but is by no means its only growth tailwind. Although it's less clear the degree to which it could impact Apple's financials, many hope that Apple's planned refresh of its iPad tablets could also help reinvigorate Apple's ailing tablet business. And then there's the matter of Apple's upcoming iWatch. Although projections on potential iWatch shipments probably aren't even worth monitoring at this point, it's hard to overlook the highly attractive margin profile for the global watch industry, which would certainly be accretive to Apple's overall financials. Although it isn't selling for the rock-bottom prices of mid-2013, Apple stock is still by no means expensive either. It's current price-to-earnings ratio of 16x, although still lower than that of the overall market, continues to partially mask the relative bargain that is Apple stock. In my mind, Apple's massive overseas cash hoard makes metrics like Apple's EV-to-free cash flow multiple of 12x a better barometer of Apple's relative cheapness. Let's stop and consider Apple's current total cash yield. So buying Apple at today's historically elevated prices will still net investors a virtual cash yield of 10%. That's certainly well below the kind of historical return profile we're accustomed to from Apple, but it's certainly an attractive overall risk-reward proposition in today's low yield environment. Beyond that, factoring in additional tailwinds such as Apple's ongoing and highly accretive share buyback program, reduced margin pressure from warranty issues, and the multiple top line growth drivers outlined above, and I'll certainly contend that Apple stock still provides plenty of opportunity for investors at its current levels. Apple's years of mega-growth are gone forever. Although I contend this line of thinking is somewhat erroneous, there's no denying Apple is a victim of the law of large numbers to some extent. However, for investors looking to own a safe, relatively stable stock that I believe should still thrive in the years ahead, adding Apple to your portfolio certainly wouldn't be the worst idea.